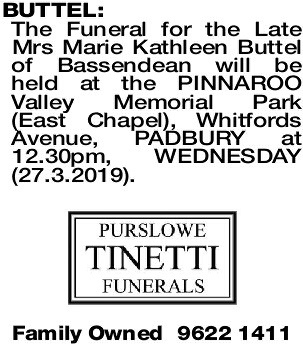 The Funeral for the Late Mrs Marie Kathleen Buttel of Bassendean will be held at the P INNAROO Valley Memorial Park (East Chapel), Whitfords Avenue, PADBURY at 12.30pm, WEDNESDAY (27.3.2019). 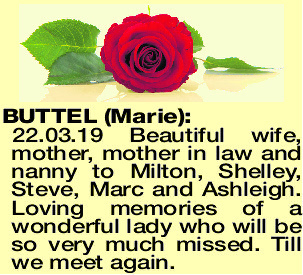 BUTTEL MARIE 22.03.19 Beautiful wife, mother, mother in law and nanny to Milton, Shelley, Steve, Marc and Ashleigh. 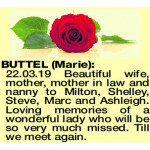 Loving memories of a wonderful lady who will be so very much missed. Till we meet again. 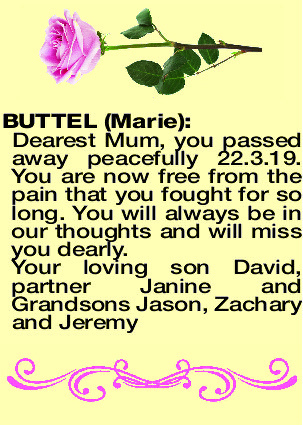 BUTTEL MARIE Dearest Mum, you passed away peacefully 22.3.19. You are now free from the pain that you fought for so long. 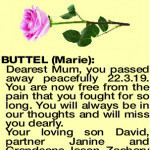 You will always be in our thoughts and will miss you dearly.